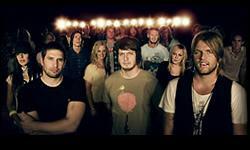 The band formed as close friends from within youth ministry, originally called Powerhouse Youth, led for many years by Donna Crouch. As the house band for the youth meetings of Powerhouse, the band played covers of Hillsong Church and various other ministries' music, sometimes members contributing to Youth Alive and its' albums (Darlene Zschech was involved in Youth Alive before Hillsong Church). Dr. Mark Evans (Macquarie Uni) states in his Ph. D thesis, A youth band was formed from the Hillsong music team, which took what was happening in the church musically and played it louder and rockier, appealing directly to a youth demographic. Steve McPherson, Deb Ezzy and Donia Makedonez were significant members. Powerhouse grew and was split in the late 1990s into two youth groups, Powerhouse (18–25 years of age) and Wildlife (12-16 yrs). Reuben Morgan, assisted by Marcus Beaumont and Tanya Riches were placed in charge of the Powerhouse band, with the former Channel V Leg-Up competition winner Able band boys, Joel Houston and Marty Sampson in charge of Wildlife, while Luke Munns was the main drummer, and Michael Guy Chislett the main guitarist. In the Summer of 1997, the new team made a huge impact at their youth ministry's Summer Camp. After coming back from Summer Camp with God full in their hearts, the many youth ministries in Hillsong Church joined together as one, and started to call the nights, UNITED Nights. When united, God does something powerful. Delirious? Martin Smith's song Did You Feel the Mountains Tremble was the theme song of the camp, and the momentum of youth carried well beyond the camp into church services. Reuben Morgan wrote 'My Redeemer Lives' as a way for the youth to continue worshipping, along with many other songs that appear on the album 'By Your Side' written by Marty Sampson and Luke Munns Stay. Darlene Zschech suggested to Reuben that they make an album in 1998 after many songs were written in the youth ministry, and the EP 'One' was recorded. The album was packaged with the Hillsong annual album, and both achieved Gold sale status in Australia. Everyday was recorded in 1999. The band continued to release an album each year, rebranding as Hillsong United in 2002 after Reuben Morgan stepped down as co-worship leader of the band. Joel Houston, the eldest son of the church's senior pastor Brian Houston, stepped up to lead the group together with Marty. Current members of the Hillsong United band include Jonathon Douglass (J.D. ), Jad Gillies, Holly Watson, Annie Garratt, Bec Gillies, and Michelle Fragar, daughter of Russell Fragar. Michael Guy Chislett plays guitar and Matthew Tennikoff plays bass guitar. Former original drummer Luke Munns made a transition from the drums to front the rock/indie band LUKAS. Popular New Zealand artist Brooke Fraser recently joined the band when she joined the church, first appearing on United We Stand. The annual Hillsong United CD/DVD was recorded over many years during their October youth conference Encounterfest, with the album released in the first quarter of the following year. The 2007 album All of the Above was the first album to be fully studio recorded, containing videos of songs on the DVD. The band has toured in a number of countries, leading worship to thousands in North and South America, Europe, Asia and Africa. Following his marriage to Michelle on November 2006, Marty stepped down as one of the main worship leaders of the band. He contributed two more songs with United, Devotion (which he wrote & sang on the album) & Saviour King (which he wrote w/ Mia Fieldes), before he officially stepped down. These songs were part of the 2007 release All of the Above . Brooke replaced Marty as one of the principal worship leaders of the band, while Marty moved on to join the main band to serve as one of main Hillsong worship leaders alongside Darlene and Reuben.